My Ipoh Heritage Walk is a leisurely stroll around the compact and historic old town area of Ipoh. The walk is about 4 miles long but you can extend or shorten it depending on your energy levels. 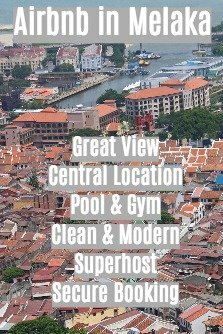 In just over 130 years Ipoh transformed itself from a sleepy Malay village to the bustling metropolis it is today, the fourth largest city in Malaysia with a population of over 700,000. Its boom period began around 1880 and lasted until well into the 1930s, largely on the back of tin mining and it became known as the town that tin built. The tin rush drew in hordes of migrants, mostly Chinese, many of whom went on to build substantial fortunes. This wealth is reflected in the architecture of the period and many fine buildings remain in the old part of the city, west of the River Kinta, and are covered in this Ipoh Heritage Walk. The Ipoh Heritage Walk starts at the Railway Station and if you are travelling up from KL you could use the spanking new electric train service (see Getting There section below). 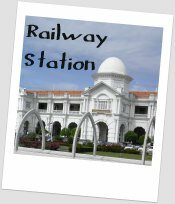 Ipoh's railway station is a superb example of colonial architecture, completed in 1917 and designed by the prolific and talented British architect, A.B Hubback, who also built Kuala Lumpur's famous station. 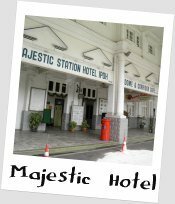 The building also houses the Majestic Station Hotel which calls itself a 'Grandiose Moorish Colonial Hotel' and is sometimes referred to by the locals as the Taj Mahal Of Ipoh. That is something of an exaggeration but it does have an air of faded grandeur to it and the hotel's verandah, stretching the full length of the building, is the sort of place that gin and tonic was invented for. However they were selling no alcohol during my visit. To get to the hotel lobby you can either take the ancient caged lift, the sort with a sliding metal grille that you have to close by hand, or you can walk up the wood panelled staircase. If the truth be told this hotel is rather run down and it is crying out for a five star luxury makeover. I hope it gets one. 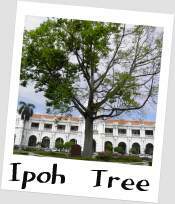 In the small garden in front of the station is a specimen of the ipoh tree after which the town is named. The ipoh tree contains a poisonous sap which the orang asli use to tip the darts of their blowpipes. Across the street is the stately, neo classical style Town Hall and Old Post Office building (the post office portion was in the rear). This building was also designed by our friend Mr. Hubback and built during the First World War. 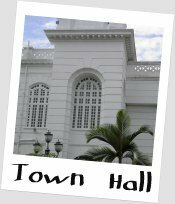 This building was undergoing some sort of refurbishment during my visit but it seems it still serves as a town hall. 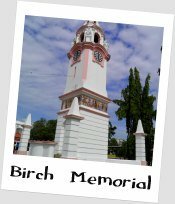 Continuing our Ipoh Heritage Walk along Jalan Dewan (formerly Post Office Road) you will see the Birch Memorial, built in 1909 to commemorate the first British Resident of Perak State, JWW Birch, whose somewhat heavy-handed attempts to extend British authority over the area resulted in him being stabbed to death in 1875. The right hand shophouse in this photo (93 Belfield Street - now Jalan Sultan Yussuf) once housed the Mikasa Photo Studio where a Japanese spy called Masaji Fukabori was said to have operated prior to WWII. This was not unusual as the authorities subsequently confirmed their suspicions that many of the Japanese barbers and photographers operating in Malaya were compiling intelligence to assist the Japanese invasion. There were 4 Japanese run photo studios in Ipoh alone in the 1930s some of which called themselves 'photographers for mines and estates'. A convenient cover for snooping around! 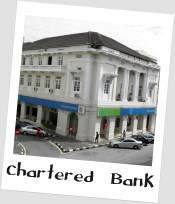 Heading up Jalan Dato Maharajalela (formerly Station Road), you will pass the impressive Chartered Bank building (still occupied by StanChart) dating from 1924. At that time Chartered Bank was the leading bank for the tin industry and the major banker to the Straits Trading Company, a big tin-ore exporter, whose former office building lies directly across the street from Chartered Bank. 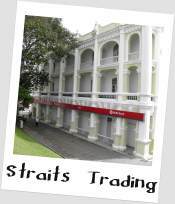 OCBC Bank now occupies the Straits Trading Company premises which were built in 1907 in Italian Renaissance style. Nearby is another bank building, Mercantile Bank, built in 1931 in art-deco style. Now occupied by a beauty products company, the building remains in excellent condition. 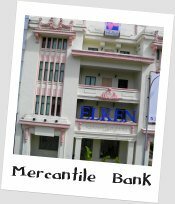 Mercantile Bank was taken over by Hongkong Bank in 1959. Opposite is an unusual heritage building, Malaysia's first multi storey car park. It only has two floors and there are no ticket machines - parking is still free! 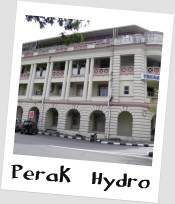 On the next corner sits the premises of the former Perak River Hydro-Electric Power Company, formed in London in 1926 and for many years the largest power supplier in Malaya. They built a dam and hydro electric power station at Chenderdoh on the Perak River in 1930. I suppose you could call them an early pioneer in green energy. 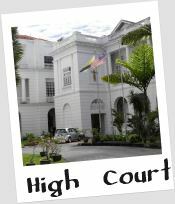 Next in our Ipoh Heritage Walk is the gleaming white neo-classical High Court building completed in 1928. You will notice the offices of many law firms in the streets near the court. Ipoh must be a legal hub for the state of Perak. 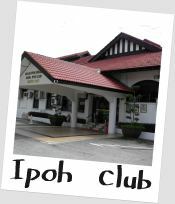 The next point of interest is the Royal Ipoh Club. 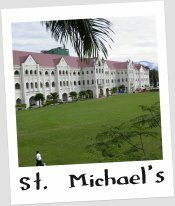 It was believed to have been founded in 1895 - possibly earlier - the archives were destroyed during the war during which the Japanese used the club as a laundry house for their soldiers messing in the neighbouring St. Michael's Institution. Virtually every town of any size in old Malaya would have had its Club (the colonial Brits liked their clubs!). Typically, the Ipoh club occupies a prime position overlooking the padang. Not much cricket being played on the padang these days it seems. 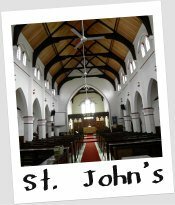 The other bastion of British colonial life of course was the Church, though perhaps ranking lower than the club in terms of priorities! 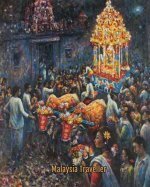 The Church of St. John The Divine, when finished in 1912 was the largest church in Malaya. Its bricks were cemented with coconut fibre, sugar and egg whites among other things. That must be why the church smells so nice inside. The Japanese used the building as a noodle factory during the war. 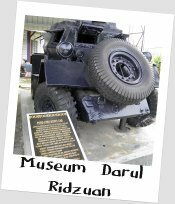 A few minutes away is the Museum Darul Ridzuan. It has a modest general collection of exhibits. Not the world's best museum but it is free and air-conditioned. Take a short break from your Ipoh Heritage Walk. You'll be needing to cool off by now after all this walking. Heading back towards the town centre you cannot miss the imposing St. Michael's Institution. A school with over 2,000 pupils, it is a massive gothic style building, with classroom doors and windows aligned north/south instead of east/west so as not to disturb pupils with early morning and late afternoon sunrays. The Japanese used the school as Perak government headquarters during the occupation. 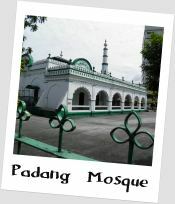 Next door is the Town Padang Mosque. It was constructed in 1908 in Moghul style and has features similar to those in the Red Fort, Delhi. It was financed by a wealthy Muslim Tamil businessman, Shaik Adam. Inside is a lovely iron spiral staircase. At this stage of your Ipoh Heritage Walk you will be gasping for a drink and something to eat. Fortunately, nearby is the F.M.S. Bar & Restaurant, said to be the oldest restaurant in Malaysia which began operating on its current site in 1923. 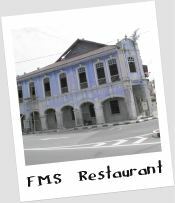 It is even older than the Coliseum cafe in KL with whom it competes for the most nostalgic atmosphere of olden days. Sadly it was closed during my visit and has been for the past year or two while some serious renovation is going on. It seems to be taking its time to reopen but hopefully it will be ready for your visit. Take a break now. 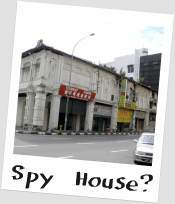 For Part 2 of the Ipoh Heritage walk, click here.